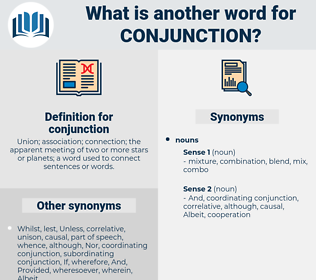 What is another word for conjunction? Union; association; connection; the apparent meeting of two or more stars or planets; a word used to connect sentences or words. collaboration, combination, cooperation, co-operation, tandem, Concertation. coordinates, association, coordination, relationship, partnership, partnerships, link, correlation, collaborative, occasion, context, co-ordination, conjugation, linkage, interaction, confluence, collusion, collaborating, contact, light, bonding, addition, common, participation, concerto, interconnection, coinciding, hand-in-hand, framework, co-authorship, interplay, bond, cohesion, conjugate, concurrence, regard, regards, competition, involvement, agreement, concomitant, Liaising, combining, synergy, concordance, gig, co-operating, accordance, correspondence, union, interrelation, coincidence, nexus, conformity, companion, engagement, collaborate, comity, margin, affair, assistance, complementarity, conciliation. concert, liaison, consultation, articulation, opportunity. detachment, separation, disconnection, disunion, disagreement, antagonism, division, divorce. solitude, divergence, disintegration, isolation, independence. Relations to class and to individual will be considered in conjunction with teaching methods. The main point of discussion between them, however, was whether " The Scarlet Letter" should be published separately or in conjunction with other subjects. unison, contemporaneity, concomitance, overlap, contemporaneousness. subordinating conjunction, coordinating conjunction, adversative conjunction, disjunctive conjunction, copulative conjunction.